Some tips to take your git knowledge beyond beginner level. The git version control system has become the standard for modern software development thanks to its decentralised workflow, simple branching, powerful history manipulation, and speedy performance. This is fine for basic scenarios, but misses out on a lot of git’s power. Here’s a collection of tips to go beyond “survival mode”. Git is a version control tool, so lets use it to dig around the history of a project and inspect some previous versions. 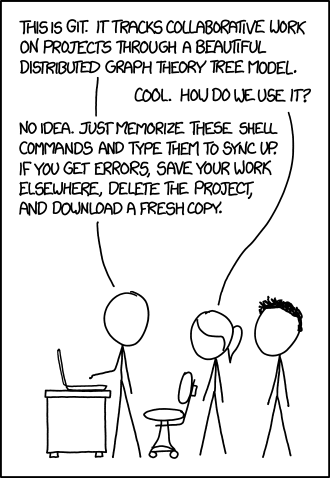 You could also use the shortcut HEAD~2, essentially “2 commits before the current”. There are lots of other ways to refer to commits quickly too. Go back to the most recent commit again with git checkout master. Disable the webservice call for now. The API is down and we don't have proper error handling yet. Uncomment when its back up and we can handle the errors reliably. Perfect, our co-worker wrote a good commit message, so there’s a helpful sentence explaining what happened. As well as using git blame on the command line, services like Github have line blaming built into their online code viewer. Made a spelling mistake in your most recent commit? IMPORTANT: --amend will change the hash of your commit, and the version history is now considered different. The commit 47eb21a has been replaced with a new commit 57e02a5. If you’ve pushed the old commit to a remote, git will consider your local branch different from the remote, and not let you push without using -force. If --amend is used without -m, you’ll be prompted to use the existing commit message. Beyond simple changes to the most recent commit, you’ll need to reach for the rebase command. This power comes with responsibilities - you could delete your work! Make sure to practise on a dummy repository, and check out this excellent post on Thoughbot’s blog to learn more. Pull requests can quickly get out of date while they’re being reviewed, especially in a busy project. You’ll often be asked to keep your branch up to date with the main branch (e.g. master) to show your changes are compatible with the latest version of the project, and to ensure there are no conflicts when your branch is merged. There are two typical strategies: Merging the main branch into yours, and rebasing your branch on top of the main branch. Note that all the commits on my-feature will have different hashes. You’ll need to push with --force to overwrite history on your remote branch. Good luck with your git learning, may all your merges be conflict free! Receive periodic updates about our products, services, and articles.